…the first total solar eclipse to visit the continental United States since 1979 will cruise over the heart of the nation. The 47-mile-diameter shadow of the Moon will streak across the land at 1,800 miles per hour, starting near Salem, OR and leaving over Charleston, SC. The United States will be the only country on Earth that will witness this eclipse over land, and so it is being called the Great American Eclipse. I have a page devoted to this eclipse, but since today marks the beginning of the 1-year countdown to the actual event, I thought I’d share a few thoughts. My first thought: one year is not a long time to prepare. If you don’t know where you’re going, you better get on that quick — especially if you’re looking for hotel accommodations. Even if you plan to camp out of your vehicle, you need to figure out where you’re going to be, and likely make some kind of reservation. During totality, you can directly at the eclipse, so you really don’t need any instrumentation to experience the most majestic phenomenon in nature. However, leading up to totality — and again after totality ends — there will be about 90 minutes of partial solar eclipse, and you’ll very likely want to have a way to safely view that as it progresses. To do that, you can use simple “eclipse shades” or other safe solar filter. If you don’t have those things, you’ll want to get them ASAP. My second thought: one year is a long time to prepare. The total solar eclipse will be even more meaningful when you understand just how coincidental and rare this celestial line-up is, so bone up on your eclipse science. How big is the Sun? The Moon? What are the distances between Earth and these two objects? Figure out where that 400x size-to-distance ratio comes from, and you’ll own it in your mind. While you’re at it, find out why don’t we have a total solar eclipse every month. Did you plunge in and get a solar telescope? When you receive it, use it on the sun right away. Get very comfortable using it, so on eclipse day you’re as proficient with the instrument as you are with riding a bike or driving a car. You don’t want to spend time figuring out a solar telescope while the event is happening! If you heed the advice to make a weekend of it, check the Internet often over the next several months to see what other attractions and events are happening in your viewing area. As businesses and municipalities become aware of the eclipse, you can be sure there will be additional events coming together all over the path of totality! My final thought: tell everyone you know about this event. Got kids? Let their teacher(s) know. Some schools will still be out on 8/21/2017, but teachers may well want to let their classes know about the eclipse, as well as experience it for themselves. Bring the family! And I mean extended family, too. This is certainly something family members will remember and talk about for years to come, so even if there are a few who are less than enthusiastic at the outset, I guarantee if they see the total solar eclipse they will be impressed — even moved. It’s a primordial experience, and they are NOT going to want to be ones in the family who missed it. Send folks to this blog, or whatever your favorite eclipse site is, and get them thinking right now about viewing this most rare and awe-inspiring of natural spectacles. Remember, partial eclipses are NOTHING compared to a total solar eclipse, so unless you live in the path of totality, staying in your backyard isn’t going to cut it. Get yourself to totality, and try to sit on the centerline as close as practical! I have fond memories of International Astronomy Day (which this year is today — May 7). 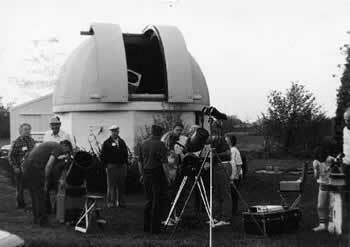 The original “astronomy outreach” event, Astronomy Day is the forerunner to International Sidewalk Astronomy Night, Global Astronomy Month, and yes, even the International Year of Astronomy 2009. Astronomy Day is largely responsible for my early discovery of the night sky, and in many ways set me on the path to the life I enjoy today. Thirty years ago, it was “National” Astronomy Day, and the world was a very different place. There was no Internet, or public computer networks — or computers period for most people. Mobile phones? That was Star Trek stuff. 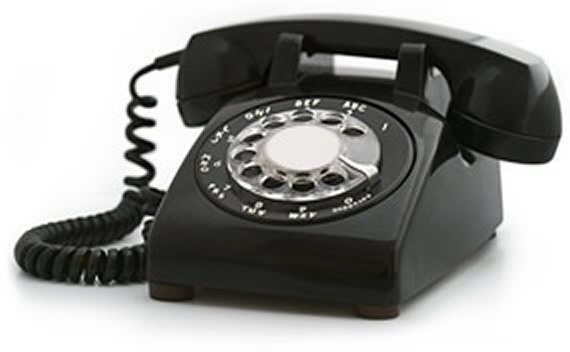 We had two telephones in our house, tied to a cord in the wall. If you wanted to talk to someone a few towns away, it was “long distance” and cost extra money; talking to your grandparents in another state was very expensive and saved for special occasions. The distributed, immediate and global communication we take for granted today simply did not exist. In that world, news of astronomy was hard to come by. There were a few magazines (Astronomy and Sky & Telescope) and that was pretty much it. 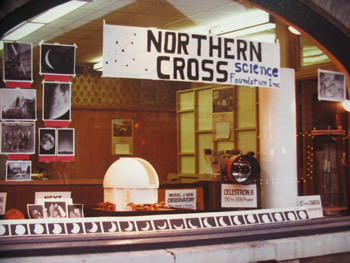 Our local astronomy club was around since 1974, but such organizations didn’t really have a way to connect with the public. Newspapers, even local ones, were prime-time, and unless you had something really important, most reporters wouldn’t give you the time of day. There were still downtown shopping districts, though, and one way to get your name our there was to have a display in a local shopkeep’s window, hoping to ensnare passers-by as they went about their errands for the week. Sometimes you could even keep the display there for a month! So when Astronomy Day rolled around one year in the early ’80s, it was a big enough deal to get some ink in the local press: a half-page story with a photo of the local observatory and a lunar eclipse. That was enough, though, to capture the attention of my middle school guidence counselor. She clipped the article and gave it to me at school. After taking it home and showing my (very supportive) parents, I found myself heading to local mall that Saturday, to see their display of telescopes, astronomy books, and other goodies. Later that evening, we followed the mimeographed map they gave us and found our way to their observatory way out in the boondocks. I got my first view of Saturn, Jupiter, and the Moon through their 12.5″ Newtonian reflector in a 16-foot wooden-domed observatory, and I was blown away. “People can look into outer space with a telescope that they built themselves? I want to learn how to do that!” The rest, as they say, is history. So today, if you’re part of a group doing an Astronomy Day celebration, take a few moments to reflect on your first experience with a telescope, and keep that feeling in mind when interacting with your guests — especially the little ones. You could very well be talking to future astronomical society presidents, engineers, astronomers, and maybe even an or two astronaut in the making.